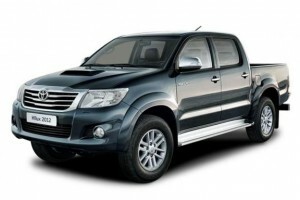 Toyota Hilux Pickup Invincible D/Cab Pick Up 2.4 D-4D Manual available on 12 month Fixed Short Term Contract. These vehicles are available in limited numbers and are on a 1st come 1st serve basis. We do not guarantee colours or options on the vehicles. Stock changes daily. There maybe a short lead time from date of order. Please contact the short term leasing team for more information. Excess Mileage: £0.45 +VAT per mile. Contract Information: 12 month fixed short term contract hire based on an initial payment and followed by 11 monthly payments taken by Direct Debit every month, with the first Direct Debit extracting approx. 1 month from the delivery date. This is a fixed contract and cannot be terminated early without penalties and cannot be extended without written permission before the end of the agreement. Credit Issues / Non Status: If you are Non-Status, a new business startup, and Expat or have difficulty in obtaining credit, CCJ's, Adverse Credit or historical financial difficulties, we need to know as soon as possible as this could delay your application, but we can still help. Terms may differ if you do have credit problems or you are a new business start up, but we may be able to offer reasonable terms! We look at every application on a case-by-case basis with affordability and stability being the most important part of the application process.